The very last pick for round one. Made by Lianne. My head hurts so I'm going to try and get this out quick as I can and head off to bed. She's Golden is a white polish with gold shimmer. It's actually a lot whiter than I originally thought it'd be. I firgured it'd be a bit more gold. 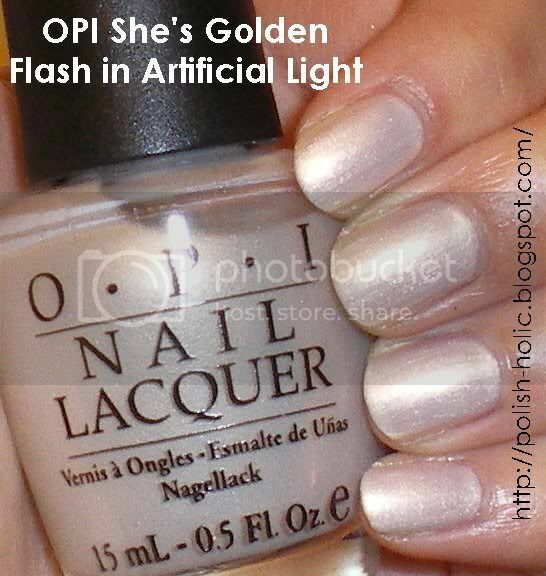 The gold shimmer adds an extra dimension, but in the end it is definitely a white polish. There is no mistaking that. So Lianne, this is nothing like the pictures of RBL Moxie I've seen. I think if you want to get closer, try Essie Amalfi (although it is really sheer). I'll have pictures of that one up soon for you. And this picture is crappy. Really really crappy. So unattractive. I'm stuck at school for all the best sunshine hours so this is a picture done in artificial light. I'll see if I can do some sunlight swatches of this in the next couple weeks and I'll edit this entry with them. Anyhow, this is three coats, no top coat. Very smooth application. Surprisingly non-streaky despite its sheerness. I think you can do this as a one coater for a goldie pearlescent look. I did three coats to see if I could get to fully opaque. But still a visible nail line. Edit 2/14/2010: I actually took a lot of pics for this one. None of these have top coat. The first two is just two coats. I actually really liked the way this looks. You can see the pink from my nail beds showing through. The next few pics are with three coats. The second one isn't direct sunlight. I kinda hoped to capture how sheer it was. Thanks for posting. This color is still untried in my collection, but now that I have seen that it is more white than golden; I am super excited to try it! I'm glad this was useful for you. =) And I was definite surprised about how white it was. That is such a pretty color! I agree it looks awfully white for a name with "golden" in it! gildedangel: I was really thinking it'd at least look offwhite, but nope. Kelly: I agree, pretty. Too bad it looks so weird on me. Sarah: Oh my mom didn't see it. The moment I put it on I knew it was not meant to be and changed it. Thank you! :) I'll definitely have a look at Amalfi.. now that I've tried the RBL formula though I'm really wishing Moxie was still available. Ah wells. Hope you're feeling better! I think it looks gorgeous on U! Thanks! I think the picture is not very flattering though. Yeah, it really does have that sort of weddingy feel to it.